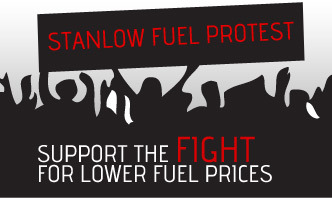 Home › Fuel Protests › Stanlow Fuel protest today! Show your support! In case you have been on another planet, the Stanlow Fuel protest in Chester is due to take place today. The protest has been quite slow to gather attention from the UK press but the organisers have now confirmed that SkyNews & BBC News will be in attendance as well as the local rag Chester Chronicle, who will be updating their website live from the event. Meet at the Chester Services, 7PM sharp with the go slow beginning at 7.30. Please show your support for this protest, for too long we have put up with the unfair fuel tax that is crippling motorists. Spread the word using the sharethis buttons below. We’ll try and provide updates via our Hypermiler Twitter Account through out the night, so stay tuned. If you have any news on this or any other protest then please contact us. Likewise if you have any pictures from tonight’s protest. It is getting more and more difficult as a pensioner to make ends meet, putting petrol prices up again and again is hitting us hard.